The lineup for WWE's World Cup tournament is now officially set. 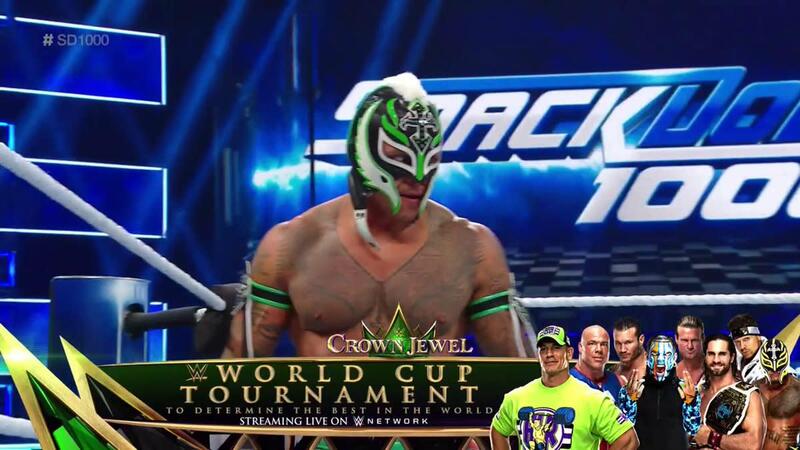 Rey Mysterio and The Miz were confirmed for the World Cup on tonight's SmackDown. The eight wrestlers for the tournament are: John Cena, Kurt Angle, Seth Rollins, Dolph Ziggler, Jeff Hardy, Randy Orton, Mysterio, and The Miz. In his first match for WWE since signing a deal to return to the promotion, Mysterio qualified by defeating Shinsuke Nakamura at SmackDown 1000. The finish was Mysterio avoiding the Kinshasa, putting Nakamura in position for the 619, and hitting the 619 and a springboard frog splash. Miz defeated Rusev in his qualifying match. It was a quick match, with Aiden English interfering and distracting Rusev. That led to Miz rolling up Rusev and pinning him while holding onto his tights. In a post-match angle, Lana low blowed English and Rusev attacked him. The World Cup tournament will be held at Crown Jewel in Riyadh, Saudi Arabia on November 2.